The programme will be posted shortly. The weekend is for both players of the Swedish säckpipa and also players of other types of pipes wishing to become acquainted with Swedish bagpipe music. Complete beginners and more advanced players are welcome. There may be some opportunity to play together as an ensemble with all combinations, but different workshops will address different musical things. Get in touch if you’d like to check your pipes are ok! Vicki Swan is a second generation piper and holds the Zorn Brons award for the traditional playing of the säckpipa. Vicki holds a degree in music specialising in performance, is a qualified music teacher specialising in instrumental music tuition, has a post graduate qualification from the Royal College of Music in London (in performance). 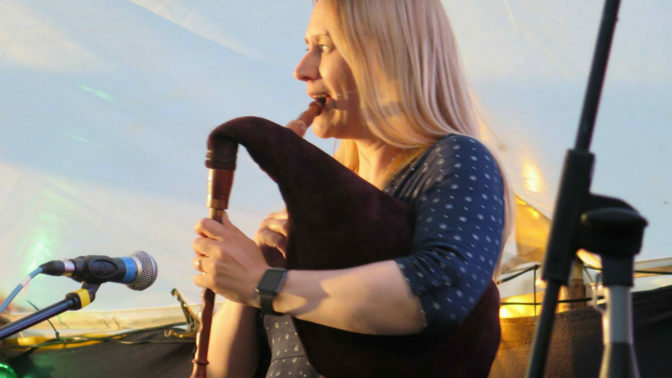 Although now possibly better known for teaching and playing the nyckelharpa, Vicki’s Masters Thesis was an investigation into the teaching and learning of the Scottish Smallpipes Online Using Podcasting as a Distribution Medium.